Having had my share of abusive relationships, I was inspired to become a Certified Life Coach and Personal Safety Trainer & Self-Defense Instructor to teach others about the signs that a relationship is veering into unhealthy territory. Stick with me here, and you’ll learn about why emotional abuse (or any other kind of abuse) occurs. Emotional abuse is kept quiet in most relationships, so you need to know how to identify it quickly before your self-esteem (and your self-confidence) is damaged. Low self-esteem will affect all of your relationships with family, friends, coworkers, and partners in the future, so it’s very important to protect it. Emotional abuse can happen in any relationship with anyone in your life, not just a romantic partnership. But it can be extra scary and embarrassing to discuss it with friends if it is your partner. It’s confusing when someone who cares about you mistreats you, and you may blame yourself for causing the abuse. You’ll likely want to defend your partner because of your feelings for them. After all, someone who cares about you wouldn’t hurt you on purpose, right? Let me share a very simple reason why all forms of abuse happen. When someone attacks you verbally, mentally, emotionally or physically, it means they are feeling out-of-control in their own life and have a need to control someone or something else to feel powerful again. They may not even know they are feeling that way or being abusive. We’ve all shoved our little brother when we were little or made fun of someone behind their back, right? This is attacking. It’s really not mysterious behavior, it’s simply a trap we fall into when we’re feeling insecure. And that insecurity doesn’t have to have anything to do with the person we’re abusing. That being said, understand that you and I have been in what I call the attacker mindset before and we’ll probably be there again. The rush of power that abuse delivers is short-lived (like a rush from a drug) so the behavior is usually repeated until the abuser feels more self-confident. That new-found confidence can be real or imagined and maybe five minutes away or five years away, which is why some people are abusive their whole lives. However, the “confidence” is perceived. You can’t get real confidence from bad behavior. It is very short-lived (the power-fix) which is why abusers keep attacking. It’s so they can keep the feeling of perceived confidence going. Self-esteem is an inside job. No one can grow it for you; you must do it yourself and some people never learn how. Instead, they choose to blame everything and everyone else for their misfortune. Keep in mind though, that the only people who get abused by others are the ones who allow it. This doesn’t mean you’re at fault if you get abused, but it does mean it’s your responsibility to get out once you identify what’s happening. If you stay, you’re simply allowing yourself to be mistreated and enabling the attacker by sticking with them. When there are no consequences for someone treating you badly, they often continue and your self-esteem goes down the tubes. In this state, you may even start abusing someone else! Unless we focus on personal development and adjust the underlying cause for our insecurities, we can fall into the same abusive trap. It’s a vicious cycle that we can stop, but it takes guts to take responsibility for changing your life. All it takes is a simple shift in perspective. If you’ve been in more than one emotionally abusive relationship (like me), I want you to take the time to build up your self-esteem before the next relationship so it can be a healthy one. When we’ve had one abusive relationship — unless we do some soul-searching and get our head and heart straightened out, we’re very likely to attract another one. One of the reasons for this is that we subconsciously blame ourselves and think it’s what we deserve. I know that sounds ridiculous but remember this is all subconscious. You can consciously be thinking and saying you deserve better, but feelings are deeper than thoughts and words. After someone tells us we’re not good enough or that no one will ever love us, our subconscious begins to believe it. You want to harness the power of your feelings to succeed in love rather than getting more of the same abusive partners. Mental abuse causes you to question how you think about yourself, while emotional abuse causes you to feel negative about yourself. Mental is thought, emotional is feelings. The difference may seem subtle, but the implications are huge. Thoughts are conscious and emotions (feelings) are subconscious and rule our lives even though we may not even realize it. In other words, emotional abuse causes you to feel bad about yourself. They decide for themselves to take action toward healing. They fake it to manipulate you into staying in the relationship so nothing has really changed. This is often called the honeymoon stage of domestic violence and is continued manipulation. As you know, when we fake anything, it’s only a matter of time until we can’t keep up the act and go back to who we really are. Tension building (resulting in abuse). Calm (attacker is temporarily feeling powerful until power-fix wears off). manipulation, and refusal to ever be pleased (no matter what you do). Some examples are making jokes at your expense and blaming you for things that aren’t your fault (like their bad behavior). Remember that mental, verbal and physical abuse can also be emotionally abusive if they cause you to feel bad about yourself. Intimidation, threats like “No one will ever love you,” or “If I can’t have you, I’ll make sure no one will,” can scare us into submission. 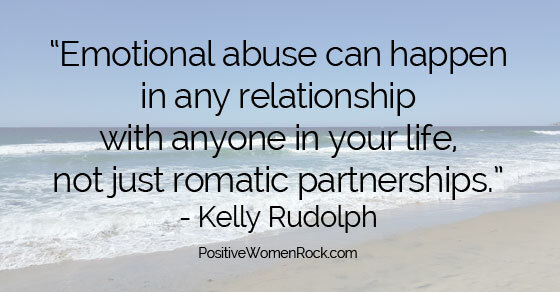 This is one reason it is vital to identify emotional abuse right away and exit the relationship to protect ourselves. Hi, I’m Kelly Rudolph, Certified Life Coach, Hypnotherapist, NLP Practitioner, and Founder of PositiveWomenRock. If you tired of stress, lack of confidence and fear about your future, let’s talk. I can help. Get my free Life Strategies now.